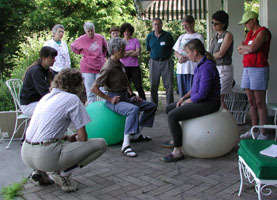 In one of your clinics some time ago, when we were doing the “bubble” exercise, you suggested using a bubble when you drive. Well I have used that suggestion for years. It works so well. So helpful in rush hour traffic, and especially helpful when I am driving a trailer. Thanks for all you do to improve others’ lives. I had a wonderful trip to Virginia. The long drive home enabled me to “marinate” on your lessons. You’re truly a genius! I participated in a couple of your clinics at Happily Ever After Dressage, riding Dani’s Appaloosa Sammie. I’m sorry the opportunity hasn’t presented again, but I wanted to tell you those lessons have had a profound and lasting impact on my riding. Folding in the middle immediately made my back and my horse’s back more comfortable. Turning my knees in not only fixed my leg position, it makes my legs so relaxed my toes are warm in winter! The platform stirrups showed me how I ducked to the right, and falling off the ball showed me how lopsided I sat. The stirrups on my western saddle (chosen for my horse’s comfort) are still anchored in position underneath me with the exercise bands you gave me. Lynn A.
I just wanted to say thanks again for the great clinic! What an amazing difference in my riding! The mind body connection is so interesting. Activating all those old muscle memories has also flooded me with long forgotten memories of the lessons when I first learned to ride this way, horses and people from the past and so on. Really interesting experience to ride with those loose thoughts rolling around in my head. That is dissipating, and now I am just riding better and better, really fun! Thanks! Can’t wait to see what happens next time! I’ve been experimenting with getting reacquainted with my right seat bone–in the car, in front of the computer, etc. following our lesson last week. But the happiest moment of all was in my regular riding lesson when I could (at some times, not always) get support from my feet, feel both seat bones, and stretch up. [My Instructor] was pretty happy with the changes, too. . . and Fhin, [my horse] went very well. I am so thrilled with the ongoing results of my clinic experience with you that I am actually e-mailing you instead of just thinking about it! 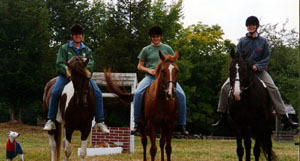 When I rode the first few times after the clinic I still had that new level of awareness in my balance (“equal-sidedness”), where my feet should be, and some new ability to bring the horse up in the back with seat and leg. Wow! I continued with closing my right eye when my brain registered loss of equal-sidedness or difficulty maintaining outside aids and found that it continued to help me with those two things plus more. Recently I have added closing one eye when on the ground walking, in the house and briefly while driving (only on Vashon!) What I am finding is that my left eye is now seeing MORE. Peripheral vision has expanded so that there is less of a difference between the two eyes. This may fluctuate however, because in Jen lessons there are times when it seems to me that the right eye just “takes over” and my brain says: “close it”. Before the clinic I had reread two thirds of your book and finished it right after. With my improved alignment and balance I have been “being Arthur”, lengthening up the back, practicing a deep seat and weighting one seat bone as an aid, and using an unbendable arm with that new outside rein I now have. The last time I hacked out Hal, I was playing with everything, enjoying myself tremendously and the thought hit me: this is all so incredibly SIMPLE! Thank you, Thank you, Thank you! Canter. 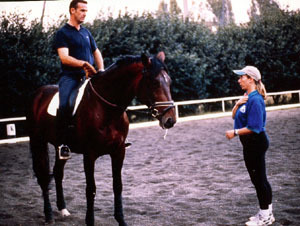 The first Jen lesson after the clinic we went to finish with canter (from trot) and Quincey would not give me a depart. Instead of relapsing into doing more and more to get it, I stuck to my guns of keeping both of us balanced, her forward and that pause at the top of the rise. 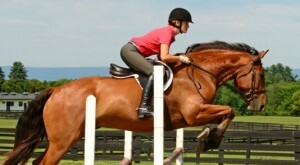 The result was a trot that got better and better until Jen said–forget canter keep that trot! And we did for about 10 minutes. I felt the problem was the timing of my aids so I did a practice session at Lori’s to see if I could “ask” for canter just past the top of the rise when she was on the outside hind, because of her rather short stride (or my slowness) I am too late if I wait to sit. It didn’t take too long to get something that seemed to work–canter left was way easy, canter right I had to tweak a bit (the addition of more inside leg as I was coming down to sit). Well, at this weeks lesson when we finished with canter the first depart was wrong lead but immediate and energetic. The second was correct lead (right), immediate and kind of a mini explosion into a more impulsive and LONGER stride! I could feel push from behind, more air time and more up in front! Was she rewarding me for finally getting a clue? I cannot tell you how pleased I am. Sorry this is so long. I am just getting around to hamstring to ball of foot/ quads to ankle with interesting insights and positive results–more on this later. I finally had a chance today to really just sit and play with my horse and some of the things you talked about during the clinic and I had a discovery. I was really intrigued by the quad to ankle – hamstring to ball of foot idea. This is probably just another way of saying something else you have said but it really stuck with me. I played with it a little during the clinic but don’t really remember what happened. I rode Carissa this morning and found that by using very little movement with the upper leg muscles all kinds of good things happened. I also found that if I am not careful I am using the opposite muscle than I should be using. No wonder she stops or backs off sometimes. She feels everything and when she is listening she is always moving something. I found that my body got very still and she got forward and straight and responsive. I used my outside leg ham to ball movement and got a very nice canter depart. It was fun. I decided I would go get the four year old and see how it worked on her and had similar results. Not quite as responsive but she definitely was responding positively to such small movements. I can’t wait to ride tomorrow and use it again. You have found the secret to what would be called a very advanced use of the leg. Recently I have been working on my next articles for Eclectic Horseman. 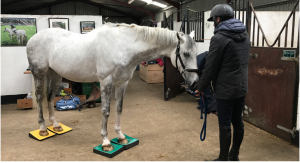 In these texts they talk about the subtle use of weight on the stirrup and that different pressures result in aids to the horse which are invisible – the ultimate use of the leg aids. 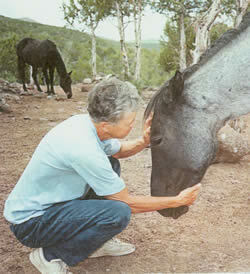 This is exactly what I am hoping my students achieve, the ability to whisper to their horse’s through the aids. It seems that if we could ride the young horses with such subtly we do not have to resort to gross or large movements. However this subtle use of the leg is often impossible because the wrong muscle groups are working together. Hence most riders fail to find this subtle leg. The morning talks and the relaxation was very useful. What I felt the first day when laying on my back compared to the last day was such an awakening for me. I live with too much stress! I look forward to riding my horse to relax not to take Advil before and after I ride to deal with the pain. The third day was very emotional for me. I actually cried when I took the saddle and bridle off my horse. Thank you! After my previous appetizers of auditing your clinics and lessons, I was so pleased to get to the meat and potatoes and dessert of riding Scratch in your clinic at Mary Pat’s this October. It was one of the best learning experiences of my life. You are truly amazing in your knowledge and intuition and your skill in seeing exactly what each horse and rider needs and tailoring the lesson to fit those needs. Your teaching is totally positive and encouraging, as you keep riders on task. you are innovative, trying different methods and aids, like bands and boards, neck ropes, tying down arms, holding crops, physioballs and baling twine longeing, to help riders reach their goals. It was good that you gave homework and asked what I had learned and if I had questions. I really appreciate the way you understood Scratch’s fear and anxiety and calmed him by using TTouch and softly stroking his ears and head. Scratch was untrained as a 3 year old when I got him and over the years we have built a mutual bond of trust. you have preserved and built upon that trust. Perhaps the most valuable lesson you gave me was to coach me in helping Scratch work through his anxiety by re-directing his energy through trotting circles. it has given me confidence to stay calm and use that tool in the future with my new “in gravity alignment” position. And, your lessons were fun. I enjoyed sharing some humor with you along the way. i like the way you treat everyone the same, from advanced riders with $20,000 horses to old ladies with everyday, but priceless, trail partners. Thank you! Thanks so much for all that you have taught me. You really get people and translate so well to each individual! I look forward to making great progress with you! Thanks again for your Effortless Rider class. It is always enlightening. Your ability to combine the physiology and hard science with the experience of the awareness through movement really help integrate my left and right brain. The intellectual balance is improving my physical balance. Thank you so much for the awesomme clinic and insight. I’ve got my husband blowing up our ball right now so I can get the movement in the left hip to match the right. I knew this clinic was just what I needed right now! Once again, thank you for sharing your wisdom and knowledge with us at Kathy and Laura’s clinic! Your creative, hands-on way of communicating the information allowed me to receive, experience and process the information shared. I also want to applaud you for the excellent teacher you’ve provided for me through Laura Verink! Laura is also a gifted trainer and communicator and my riding skills have continued to improve under her instruction. it was fun to watch her be the “student”, but it was also obvious that she has been able to learn and apply the principles you teach as well. Cantering has been one of my biggest challenges. Fear and speed definitely play a part in my “issues” (especially at 51!). But that last trip around the arena in an improved position while giving the horse direction showed me that I can be secure in the saddle even on the turns that feel “fast” to me. 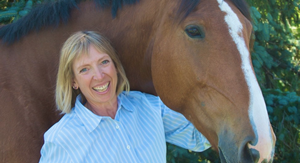 I am looking forward to working with my horse and reaching the point where he will respond in a more balanced, secure way because I’m riding in a more balanced, secure way. Thanks again for a wonderful, meaningful learning experience! Wendy on the physioball in Geneseo, New York.